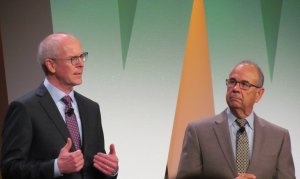 GROWMARK CEO Jim Spradlin (left) and Chairman of the Board John Reifsteck (right) address those gathered for the company’s annual meeting in Chicago. GROWMARK CEO Jim Spradlin said the company’s new strategy – based on the acronym ‘GROW’ – is not just focused on getting bigger. It’s focused on getting better. During a shared address at the company’s annual meeting in Chicago, Spradlin and Board Chairman John Reifsteck reflected back on the past 30 years or more in agriculture, sharing both personal experiences as well as changes that have come to the GROWMARK system. Spradlin recognized farmer members are dealing with a very difficult agriculture economy right now, with trade issues only adding to the seriousness of the situation. But he believes farmers are resilient and will continue to adjust. He said great attitudes prevail across the organization at the farm level, even though it is more challenging than it has been in recent years. GROWMARK began a new fiscal year on Sept. 1, and Spradlin shared that this was a solid year fiscally for the cooperative, especially in the agronomy and grain divisions.